Our Pump Protector is designed to protect your airless spray equipment against rust and corrosion, to lengthen the life of your equipment, and to do so in an environmentally friendly manner. 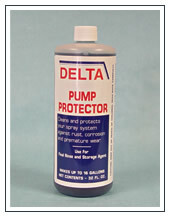 Delta First’s standard Pump Protector is a concentrate !! This means it is meant to be diluted with water in the field and used as a final rinse. It contains both lubricants and corrosion inhibitors which will prevent rust from forming in your equipment, and which keep all the lines flexible and lubricated to maximize the life of your equipment. It also will stop premature wear which shortens the useful life of your equipment. And, it prevents sticking seats which prevent smooth operation of your sprayer. Simply mix 4 ounces of Pump Protector with a gallon of water, then run this mixture in through the main intake of the airless sprayer. The mixture will run throughout the lines, where the paint goes, and will clean out the equipment quickly and economically. Since it is meant to be diluted in the field, 4 ounces per gallon of water, it goes a long, long way. One quart bottle of this product will make 8 gallons. It usually only takes 1 gallon of diluted pump protector to clean out the system, so a quart bottle will last about 8 work days….in most cases, you are cleaning and preserving your equipment for pennies per day!!! Many people also view mineral spirits (either mixed with a lightweight oil or alone) as an alternative for Pump Protector. This approach is perceived as being less expensive than using a proper Pump Protector, BUT since our product is a concentrate, and mineral spirits need to be used undiluted, there is little cost difference. Further, mineral spirits lack corrosion inhibitors, and also are not nearly as environmentally friendly as our Pump Protector (our primary lubricant is approved by the FDA as a food additive and is used extensively in women’s cosmetics).